Mariano Fortuny y Madrazo was one of the great creative minds of the early 20th century. He was celebrated by his contemporaries as the last Renaissance man . He was born in Granada Spain. 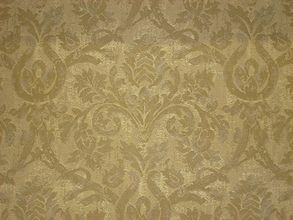 Both his father and his mother were known painters and collectors of ancient oriental fabrics. His father died when he was three years old and his mother mooved to Paris where he was educated and started painting. In 1897 he met Henriette Negrin whom he married later.In 1889 they moved to Venice. Though trained as a painter, Fortuny was an accomplished and innovative designer, architect, inventor, couturier, and lighting technician. Born in the ancient Spanish city of Granada to an artistic family (both of his parents were highly-regarded painters), Fortuny was raised first in Paris then Venice, where he spent most of his life. 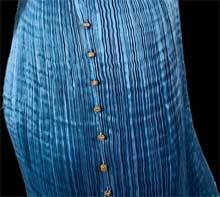 Fortuny is now most remembered for his dress designs, which were fabricated from an innovative pleated silk, produced by machines designed and patented by Fortuny, and is the forerunner to Issey Miyake's efforts. His life was dedicated to Art as he was not only an accomplished dress and fabric designer, but he also excelled in various disciplines such as interior and stage design, painting, photography, architecture, lighting. 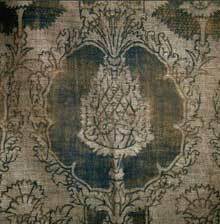 In the early 1900's Fortuny invented methods of textile dyeing and of printing fabrics, reproducing the depth, color and beauty of ancient brocades, velvets and tapestries. In 1919 he he moved his textile workshop to a former convent on the island of Giudecca. He died in his Venetian Palace 1949 and was burried in the Verano Cimetery in Rome. In 1927 Elsie Lee Gozzi ( later Elsie McNeill), an American decorator , became the sole distributor of his dresses and fabrics in the United States. After Fortuny's death she was the one who assumed the responsability for keepning Fortuny's works alive. For internal decoration he created the elegant Fortuny's lamps, which diffused subtle light through opalescent silk shades, stretched over delicate wire form. The silk was hand-painted with gold motifs inspired by Oriental art and as a finishing touch, the lamps were decorated with glass beads and silk cording. 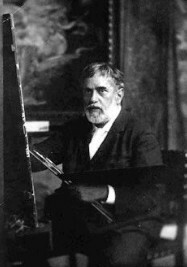 Mariano Fortuny y Madrazo was influenced by new styles and designs in textiles and fashion, by the new aesthetic and functional concepts promoted by reformers of the new applied arts, such as English designer William Morris or painter E. Burne-Jones, and by their theories on a modern style freed from the restraints of convention. 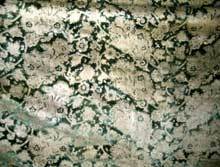 One of Fortuny's important sources of inspiration was Richard Wagner. In those years, Fortuny created the "Knossos scarf", his first purely fashion garment, made of silk, rectangular in shape, and printed with geometric, asymmetrical patterns. In 1907, Fortuny created his most spectacular Art Nouveau dress: the"Delphos robe" in pleated silk, was made famous by theatrical legends Isadora Duncan and Sarah Bernhardt. 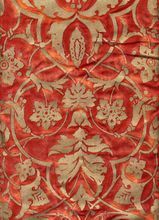 Designed in a revolutionary shape, inspired by ancient Grecian gown, the long dresses were simple and loose, artistic and functional; their borders were usually finished with Venetian colored glass beads, which were both ornamental and functional. All the pleated and printed silk, the dresses and the scarves were hand-made in his studio, as were the multi-colored velvets, the satin linings, the silk cording and belts. Before being made up, the silks were dyed in every color imaginable, with different designs or color combinations, changing according to light and movement. Desveaux Delphine, Mariano Fortuny, 1871-1949, London, 1998. Deschodt Anne Marie, Mariano Fortuny: Un magicien de Venise, Paris, 1979. Deschodt Anne Marie,and Doretta Davanzo Poli, Fortuny, NewYork, 2001. "Palazzo Fortuny: A Venetian Palace, Now the Museum of the Work of Master Textile Designer Mariano Fortuny," in Architectural Digest, October 1984. "In the Footsteps of Fortuny, Rich Venetian Fabrics", Farrell, Sarah, the New York Times, 28 July 1991.